Hôtel Le Colisée is a design hotel ideally located near the world famous Champs Elysées and halfway between the Place de la Concorde and the Arc de Triomphe. This friendly and welcoming hotel boasts a cosy lounge bar, a comfortable meeting room and a secluded inner courtyard making it the perfect base for corporate and leisure guests alike. The Hotel Le Colisée offers 45 air conditioned and very comfortable rooms. Their decor is contemporary and elegant with furniture designed by the French interior architect Sylvain Proyart and attention has been paid to every last detail to help make these rooms a perfect home away from home. The rooms have a private bathroom with shower or bathtub, toilet and hairdryer and are equipped with a minibar, a welcome tray, a desk, a telephone, a radio, a flat screen TV with satellite channels, free Wi-Fi access and safe. The cosy lounge bar features a contemporary decor, neutral colours and parquet flooring and offers a laid-back, peaceful atmosphere. Enjoy a drink and relax at the end of your long day in Paris at the Hotel Le Colisée’s lounge bar. For your business meetings, seminars and corporate events the Hotel Le Colisée offers you a well-equipped meeting room which looks out into our quiet inner courtyard. This pleasant room has large windows that let in plenty of natural light and boasts audio and video equipment, free Wi-Fi access, air conditioning and can accommodate up to 12 participants. The Hotel Le Colisée is perfectly located just steps from the bustling Champs Elysées and the Grand Palais Museum in the heart of a select fashion, culture and business district of Paris. 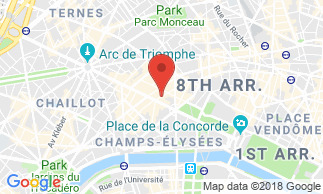 Conveniently located near our hotel is a metro station that will enable you to reach all major sites such as the Tuileries Gardens, the Louvre, the Eiffel Tower and many more. With a direct metro link to take them in no time to Porte Maillot or La Defense business districts, our business guests will enjoy staying in this lively part of Paris. A delicious buffet breakfast is served every morning from 6:30 am - 10:00 am, in our pleasant and quiet breakfast room which looks out into our paved inner courtyard. Guests can also enjoy breakfast in the privacy or their own room, from 8:00 am - 11:00 am. Breafkast is composed of hot drinks, freshly squeezed juice, cold meats, cheese, cereals, scrambled eggs, sausages, smoked salmon, fresh fruit salad, yogurt, a wide variety of bread and pastries. Breakfast is not included in the room rate: 17 EUR / person.